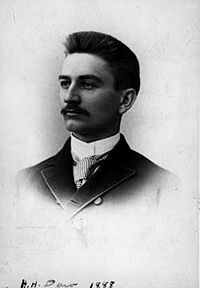 Herbert Henry Dow (February 26, 1866 – October 1930) was a U.S. (Canadian-born) chemical industrialist. He attended the Case Institute of Technology in Cleveland, Ohio, where he became a member of the Phi Kappa Psi fraternity. His most significant achievement was as founder and eponym of Dow Chemical Company in 1897 with the assistance of Charles Nold. Two years later, he also started the Dow Gardens in Midland, Michigan as a personal hobby. He and his wife, Grace, not only raised seven children but also were philanthropists who helped many organizations and causes. Herbert Henry Dow was born in 1866 in Belleville, Ontario (Canada), the eldest child of Joseph Henry Dow, an inventor and mechanical engineer. Six weeks after his birth, the family returned to their hometown of Derby, Connecticut. They moved again in 1878, this time to Cleveland, Ohio, to follow his father's job with the Derby Shovel Manufacturing Company. Dow was a precocious child, often helping his father with mechanical problems, and inventing an incubator for chicken eggs before he was 12. Several years later he and his father coinvented a small steam turbine which the United States Navy used for many years in torpedo propulsion. In 1892, he married Grace A. Ball. Grace and Herbert Dow were parents of seven children and spent their married life in Midland. They were both devoted to their family, the community, and the enhancement of the quality of life for everyone in the Midland area and in Michigan. After graduating from high school in 1884, Dow enrolled in what is now Case Western Reserve University, then known as the Case School of Applied Science. While at Case, he began researching which chemicals could be found in brines in Ohio and other areas of the United States. He discovered that brine samples from Canton, Ohio and Midland, Michigan were very rich in bromine, which at the time was a primary ingredient in medicines and was used heavily in the fledgeling photographic industry. Following his graduation from Case in 1888, Dow worked for a year as a chemistry professor at Huron Street Hospital College in Cleveland, still continuing his research into the extraction of chemicals from brine. In 1889 Dow received his first patent after inventing a more cost-effective and streamlined process for extracting bromine from brine. He quickly formed his own company, but was bankrupt within the year. His associates were impressed with his work and in 1890 helped him to found the Midland Chemical Company in Midland, Michigan. Dow continued his work for extracting bromine and by early 1891 he had invented a method of bromine extraction that became known as the Dow process, using electrolysis to successfully oxidize the bromine. Dow was not content with simply improving the bromine extraction process, but wanted to expand his research of electrolysis to yield other chemicals. His financial backers did not approve of his continued research and fired him from the Midland Chemical Company. Dow moved to Ohio and, after perfecting a process to extract chlorine and caustic soda from sodium chloride, he founded the Dow Process Company in Cleveland in 1895. The following year he returned to Midland, where he changed the name of his company to the Dow Chemical Company. Within three years, his new company had purchased the Midland Chemical Company. With his new company and new technology, Dow was able to produce bromine very cheaply, and began selling it in the United States for 36 cents per pound. At the time, the government-supported German bromine cartel, Bromkonvention, had a near-monopoly on the supply of bromine, which they sold for 49 cents per pound. The Germans had made it clear that they would flood the American market with cheap bromine if Dow attempted to sell the element abroad. In 1904 Dow defied the cartel by beginning to export his bromine at its cheaper price to England. Soon after, a Bromkonvention representative visited Dow in his office and attempted to bully him into ceasing exports. Unafraid, Dow continued exporting to England and Japan. The German cartel retaliated by flooding the US market with bromine at a mere 15 cents a pound in an attempt to put him out of business. Dow, unable to compete with the attempt at predatory pricing in the U.S., instructed his agents to quietly buy up hundreds of thousands of pounds of the German bromine locally at the low price. The Dow company then turned the tables on the cartel by repackaging the bromine and exporting it to Germany at a tremendous profit. The cartel, expecting Dow to go out of business, was unable to comprehend what was driving the enormous demand for bromine in the U.S., and where all the cheap imported bromine flooding their market was coming from. They even suspected their own members of violating their price-fixing agreement and selling in Germany below the cartel's fixed cost. The befuddled cartel continued to slash prices on their bromine in the U.S., first to 12 cents a pound, and then to 10.5 cents per pound. Dow continued selling the dumped bromine in Germany at 27 cents per pound. When the cartel finally caught on to Dow's tactic, they realized they could not keep selling below cost, and were forced to increase their prices worldwide. Dow's triumph has been used as an argument that predatory pricing is an irrational practice that would never work in the real world. The new company focused on research, and soon was able to extract many more chemicals from brine. The company was given a large opportunity to grow during World War I, when Britain blockaded the ports of Germany, which at the time included most of the world's largest chemical suppliers. Dow Chemical quickly moved to fill the gap, producing magnesium for incendiary flares, monochlorobenzine and phenol for explosives, and bromine for medicines and tear gas. By 1918, 90 percent of the Dow Chemical Company production was in support of the war effort. During this time period, Dow also created the diamond logo that is still used by the Dow Chemical Company. Following the conclusion of the War, Dow began to research the benefits of magnesium, which the company had in large supply. He discovered that it could be used to make automobile pistons. The new pistons proved to give more speed and better fuel efficiency. The Dowmetal pistons were used heavily in racing vehicles, and the 1921 winner of the Indianapolis 500 used the Dowmetal pistons in his vehicle. By the time of his death on October 1930 from cirrhosis of the liver, Dow had personally received over 90 patents. Dow was survived by his wife, Grace, and their seven children. Through Herbert Dow and his wife Grace Dow, they contributed to many different organizations. Most notably, the Dow Gardens, and The Herbert H. and Grace A. Dow Foundation which was founded in memory of Herbert Dow by Grace Dow. ↑ 1.0 1.1 Learning to Give. Herbert H. and Grace A. Dow and the Herbert H. and Grace A. Dow Foundation. Retrieved January 22, 2008. ↑ 2.0 2.1 Herbert H Dow. Ohio History Center. Retrieved January 22, 2008. ↑ 3.0 3.1 Herbert Dow, the Monopoly Breaker. Mackinac Center for Public Policy (May 1, 1997). Retrieved January 22, 2008. ↑ Herbert Henry Dow. Michigan Walk of Fame. Retrieved January 22, 2008. ↑ Herbert Henry Dow. Invent Now. Retrieved January 22, 2008. History of "Herbert Henry Dow"
This page was last modified on 20 December 2017, at 15:05.